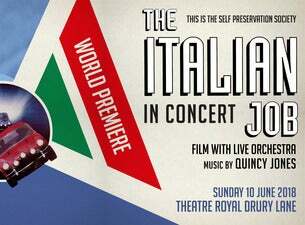 The Italian Job (1969), one of the most iconic British films, will return to the big screen for a very special performance at London’s Theatre Royal, Drury Lane, with a big band and orchestra playing the score live to picture. Consistently voted the most popular British film ever made, packed with legendary one-liners, a car chase that made global superstars out of two little Minis and literally a cliff-hanger ending, The Italian Job is ready to delight and excite audiences again nearly 50 years after it was made. The stunning HD remastered version of the film will be accompanied by a live orchestra for the first time, playing the famous soundtrack by legendary composer and producer Quincy Jones, including the song On Days Like These during the opening sequence, brilliantly funny and jazzy underscore and, of course, the riotous The Self-Preservation Society.